Picture this: you walk outside in the morning on your way to work or school. You go to get into your car but you see a problem. That problem is a pack of wild dogs viciously attacking your ride. Not just attacking, but actually trying to take a f-cking bite out of the sheetmetal. That’s exactly what happened in Chongqing, China, with these stray dogs and a Volkswagen Jetta. Now, we’re not the biggest fans of the current Jetta, but we don’t think it deserves to be physically attacked by rabid dogs. As long as you put blinders on, you won’t spot the difference. Some people just want a simple sedan that drives really well. 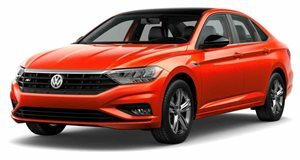 The 2019 Jetta doesn’t look drastically different, but Volkswagen has brought its bestselling car up to date with competitive tech and efficiency.